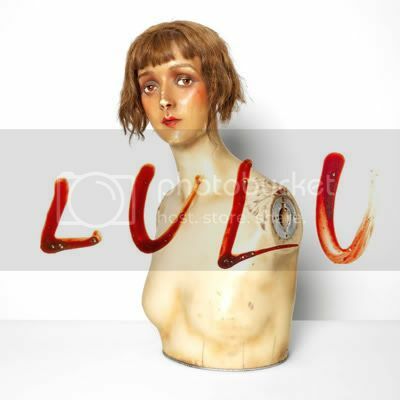 In what is sure to be one of the most talked-about alliances of the year, LOU REED & METALLICA's Lulu album will be released by Warner Bros. Records on November 1st in North America (October 31st elsewhere). The entire album is streaming online here. A deluxe version of Lulu will be released in a tube-shaped container (13cm x 1.24m), and will include a two-CD digipack package, a large 1.2m x 1.6m poster (with song lyrics), and three photographs by Anton Corbijn (50cm x 50.8cm). Lulu was co-produced by Reed, Metallica, Hal Willner who has produced albums for Reed, MARIANNE FAITHFUL, and LAURIE ANDERSON, among others and Greg Fidelman. Fidelman also mixed the record. The idea for these two giants of modern music to work together was born after the 25th anniversary Rock And Roll Hall Of Fame concerts in New York City in October 2009. Metallica -singer/guitarist James Hetfield, drummer Lars Ulrich, guitarist Kirk Hammett and bassist Rob Trujillo - played with Reed on VELVET UNDERGROUND classics, 'Sweet Jane' and 'White Light/White Heat'. "We knew from then that we were made for each other," Reed says. After that triumphant performance, Reed suggested they all make a record together. At first they planned to record an album of Reed's older material, what Ulrich describes as "some of Lou's lost jewels - songs that he felt he'd like to give a second spin, and we could do whatever it is we do to some of those songs." That idea "hung in the air for a couple of months." Then, a week or two before that session was to begin, "Lou called up and said, 'Listen, I have this other idea.'" That idea was to record a series of songs Reed had written for American avant-garde theater director Robert Wilson and German theater group the Berliner Ensemble's production of the Lulu Plays, which premiered in Aprilat theTheatre am Schiffbauerdamm in Berlin, founded by Bertolt Brecht. The songs are inspired by German expressionist Frank Wedekind's early 20th century plays Earth Spirit and Pandora's Box, and were a rewrite of Edgar Allan Poe's, The Raven, which emerged as a graphic novel on Fantagraphics Press.